Komuz is a Kyrgyz folk three-stringed musical instrument (like a lute). Its body is made of one piece of wood, mostly a dried apricot. Komuz has a rich variety of sounds. According to a legend, there lived a hunter named Kambarkan who understood the "language" of many birds and animals recognizing each of them by their sounds. One day, while he was in the woods, he heard a new wonderful sound. He was so captured by this incredible sound that he started searching for its source. For a better overview the hunter climbed a tree and from there he saw two branches of a nearby tree connected with a dried bowel of a squirrel. The sound was coming from this "string". He took a piece of string together with the timber and made a musical instrument. Thus, he became the founder of the national music and still known as the "Father of melody." 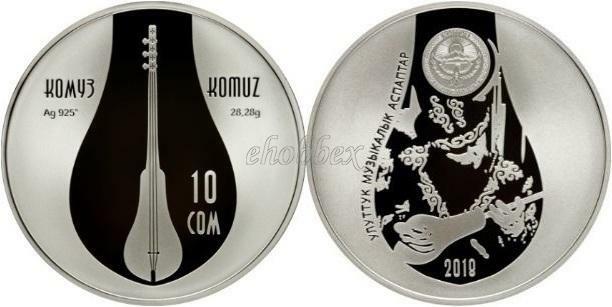 The main theme of the obverse side of the silver coin is the image of the komuz. The central part of the coin shows the denomination of the coin (10 Som). The left side of the coin specifies the name of the coin «Комуз» («Komuz») and the alloy of metal (Ag 925°), on the right side - the name of the coin in Latin letters «Komuz» and the weight of the coin (28.28 g). On the reverse of the coin, there is the coat of arms of the Kyrgyz Republic in the upper part. In the center part - an illustration of the image of a komuzist, person playing on komuz, framed by a stylized form of a musical instrument. The lower part of the coin contains the year of the coin issue (2018), there is the vertical inscription «Улуттук музыкалык аспаптар» («National musical instruments») on the left side.